Remember that petanque, as invented and played in France, is often played on natural terrains — city squares or parks. It is often played on walkways that consist of nothing but gravel or crushed stone laid down directly on the bare earth. If you live in the American Southwest, you probably don’t need to build a terrain at all. The weather is so dry that your best bet is a natural terrain, like the Palm Springs (California) Petanque Club. When someone starts thinking about building their own terrain, their first question is usually “What are the official dimensions of a petanque terrain?” The answer is that there are no specifications for an exact size. The FIPJP (the international petanque federation) specifies minimum dimensions for terrains in FIPJP-sanctioned competitions. For regional competitions the terrain must be at least 3m x 12m (10′ x 40′). For national and international competitions the terrain must be at least 4m x 15m (13′ x 50′). So 4m x 15m (13′ x 50′) is usually considered the “standard” size for a petanque terrain. For a home court, we recommend at least 3m x 12m (10′ x 40′). To be able to throw the jack to the maximum legal distance (10m) you will need a length of at least 12 meters. If it is possible to make it longer, closer to 50 feet, you will probably be happier with it. How to build a petanque terrain on the Playaboule web site. There are also videos on Youtube that give you a good idea of the process. Look for information on how to construct a bocce court. Ignore instructions for high backboards— although you will want a low wooden surround. On joyofbocce.com, click on the button on the left for COURT CONSTRUCTION. Mario Pagnoni runs that web site, and his book The Joy of Bocce is THE book about bocce. How much does it cost to build a petanque terrain? When you’re considering building your own petanque terrain, THE question, of course, is “How much will it cost?” And of course, as always, the frustrating answer is — “It depends.” It depends on what you want to build and where you want to build it. What are your local climate conditions? Does it freeze in the winter? How many inches of rain and snow do you get during a year? What is your local soil like — sand, dirt, clay? Characteristics of your local soil and climate will determine how rugged the construction needs to be to withstand extreme weather, how deep the foundation needs to be to insure proper drainage, and so on. And those things will affect the cost. After a heavy rain, do you want to be able to play on the court within a matter of hours? Or of days? How big do you want the court to be? The bigger it is, the more material, time, and labor will be required. What is the topography of your chosen site? Building a court on ground that is already flat and level is relatively straightforward. But if you’re planning on building on a slope (e.g. the side of a hill) you may need to dig out the uphill side of the court and construct a retaining wall, put down infill on the downhill side and construct a retaining wall, or both. REMEMBER… Gravity Never Sleeps. Rainwater that now runs down the side of the hill will in the future want to run right into your new petanque court. So a hillside site poses special drainage issues. That’s also true of a nice level site… if it is at the foot of a hill or in a natural depression in the ground. Do you want to go bare-bones or luxury-level? Do you want benches and tables for spectators? Lights for night play? A utility shed to hold boules, lawn chairs, rakes, and other maintenance equipment? What material do you want to use for the surface? In general, decomposed granite (DG) is your best bet, but in some areas other suitable materials (e.g. crushed volcanic cinders) may be available and economical. Bocce players like a surface of crushed seashell, but note that seashell requires regular maintenance and is prone to getting over-grown with moss and algae. How remote or accessible is your site? That is: How difficult is it to get construction materials to the site? What will be the cost for material and delivery of materials? (Often the delivery costs for a truckload of crushed stone are greater than the costs for the stone itself.) It is a good idea to make a list of the materials that you expect to need. Depending on your design, it may include multiple loads of crushed rock of different sizes, a layer of weed barrier, french drains, materials for the surround, and so on. What are the rates for rental of construction equipment? You may need to rent a power tamper to compact the layers of the surface, power equipment to drive rebar stakes for a railroad-tie surround, etc. Who is going to do the work? Are you going to do all or some of the work yourself? Or are you going to hire labor? If so, what are the local rates for labor? With this many variables to consider, about the best we can say is that your new petanque court will probably cost somewhere between several hundred and several thousand dollars. 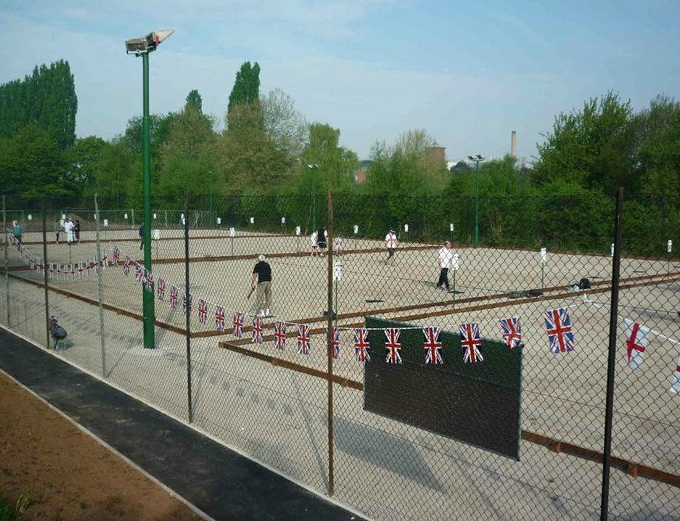 Brian Forbes is in charge of building and maintaining the petanque courts for the Nottingham City Petanque Club (NCPC) in Nottingham, England. He has experience in building and maintaining more than 30 international-sized petanque pistes. He’s graciously given us permission to host his paper on Designing and Building a Petanque Terrain. We’ve lightly edited it and added a title and a table of contents. You should also view the photos of piste construction at the NCPC web site. Here’s a photo of the NCPC pistes, from their web site. G’day there, great site – lots of beaut info! Last year our club built a terrain ‘naturel’ style on parkland in beautiful tropical Mission Beach, Far North Queensland, Australia. Our rainfall here is on average nearly 4 metres or 14 feet so drainage was a very important consideration. In the mountains of North Carolina, USA, I am building a terrain and have a question on drainage. I am at the point of putting down the fabric over the clay (our natural earth) and the the 4″ drainage pipe with sediment sock around the perimeter, three sides, and then #57 clean granite drainage stone to the slopped clay from 3″ to 6″ deep across the terrain covering the drainage pipe. After this is compacted, I’ve been told that I should install another layer of fabric before installing a 3″ layer of crusher run granite and then the final 2″ 0f 3/16 to dust granite, compacting between all layers. I am questioning the 2nd fabric layer. Can anyone give me any ideas? So far this year we have received 3750mm (12”3″) of rainfall! it is not unusual to receive 250mm (10″) in a 24 hour period in the monsoonal period! We have made no allowances for drainage apart from generally following the shape of the ground underneath. Our terrain is situated on a slightly domed part ground i.e. the terrain is slightly higher in the centre than it is on the outsides. We do not have timber or some other sort of edging or surround which would trap rainfall runoff. We simply laid an approximately 150mm (6″) thick bed of decomposed granitic sand (v. coarse) straight on top of the ground underneath. Thank you for your response and I envy you for how simple it was for you to construct your terrain. I am very new to Petanque and also being in the mountains are my challenges. I am building this terrain on the side of a slope and because of all the large trees could only make it 12′ wide and at that width one side is one cross tie high and the other is six ties high. I feel very lucky to be able to have it at all. Lots of our residents are looking forward to its completion. The advice that I have received was to have one layer of driveway fabric under the drain field stone and then after it’s compacted, to install another layer of fabric on top of that. I am looking for a second opinion on the second layer of fabric. Here is a comment that I found on a post about building your own bocce court. The post had some beautiful pictures of luxurious bocce courts overlooking the sea, etc. etc. Which prompted the following comment. I think the comment has less weight against petanque courts, which tend to be less expensive and less elaborate. But still, it is an interesting consideration. We see so many articles about which home improvements and remodels yield a good return on investment in the end and which do not. I would think a bocce court would perform very poorly in this regard. The number of people who play it in this country is small, the courts force a huge, hot, dry dirt area into a prime position of one’s yard, the opposite of an inviting garden or patio, and for all but the most devoted aficionados might be an expensive novelty that wears thin before it is even paid for. The court shown overlooking the ocean, for example, may be the dreamscape of the present owners, but would likely just be torn out (an expense) by most purchasers of such a property. By all means build one if you want, but don’t be surprised if you don’t recoup the cost, or if it even detracts from the marketability of your house when you want to sell. Here’s another comment from the same post on building a bocce court in your back yard. We installed our own court using 2×6’s, landscaping fabric to keep the weeds out, crushed limestone, and we secure a tarp when not in use to keep dogs and cats out. It’s only 8×24 but that’s all the room we could spare in our terraced yard. It cost us maybe $100 in materials but the memories are priceless. It suggests that a useful investment might be a tarp to cover the court. It will keep the neighborhood cats from using your court as a litterbox. (This might be a special problem for bocce courts, which are often surfaced with crushed sea shell.) And it might also help keep rain and snow off of your court, which might help in rainy climates or if you have drainage issues. Thank you for all your helpful links and construction advice, I am about to build my own playing field. I like your pragmatic instructions on how to modify bocce court instructions for petanque (simple is good!). However the instruction “Pick a surface material that is rougher than most bocce courts” is a bit vague! I’m on Northern CA and Decomposed Granite is economical and readily available but in doing my research, some sites suggest DG can be problematic and too fast. I’ll have good base of compacted base rock, but not sure if I need one or two layers of material above that and what exactly the specs for those materials should be. There are a large number of good local materials suppliers and several local quarries so I am pretty sure I can get whatever I need, I just don’t know exactly what to ask for!! Decomposed granite worked fine for our terrain. We did not compact the DG but obviously used a machine to level it out. We simply put a 150mm or 6″ deep layer of DG straight over the grassed surface below. Our terrain is in a very high (monsoonal) rainfall area, imagine 4m or 14′ of precipitation a year! With this in mind we left the terrain to mimic the lay of the land underneath so that the runoff from all rainwater naturally goes where it needs to. I’d say Kim’s voice of experience is just the ticket. At the risk of over-thinking something that is probably best handled with dead reckoning, here are some additional thoughts. (c) the size and shape of the rocks in the surface layer. (a) will determine what happens when the boule hits the ground. Boules will bounce more on a hard surface, so you’ll have more control over your lobs on a softer surface. The trick with (a) is both in knowing and specifying the hardness that one wants and in knowing how one goes about creating it. The installation process consists of one or more cycles of spreading material, tamping it down and compacting it, and sprinkling with water. The hardness is determined more by how the material is installed than by the material itself. I’m afraid I can’t help much there. I don’t know if there is, for instance, some setting on an automatic tamper that determines how hard the surface is, or if that is determined by how long you tamp it, if you tamp it again after moistening it, etc. I think I’d talk to some local contractors with experience in building gravel paths and/or clay tennis courts. (b) and (c) will determine how a rolling boule behaves. There are no official standards for this sort of thing, and petanque can be played on all sorts of surfaces with all sorts of variations here. In short, what you should get is a matter of personal taste. If you visit your local crushed-stone vendors you will see a large variety of sizes, textures, and colors to choose from. Remember the surfaces that you’ve played on, and pick something you like. Your rock vendor will be able to tell you how much rock to buy to cover a given area to a given depth. You might buy that much, but don’t go and dump it all on your court. If you put down too much rock, the surface may be too soft and slow. It is easier to add more surface material than it is to remove it. So keep your delivered surface rock in a pile “on the side”. Initially, put down a thin layer, and then add more to taste. And nothing is irreversible. Too soft? A bit more compacting will handle that. Too hard? Add a little more surface rock. 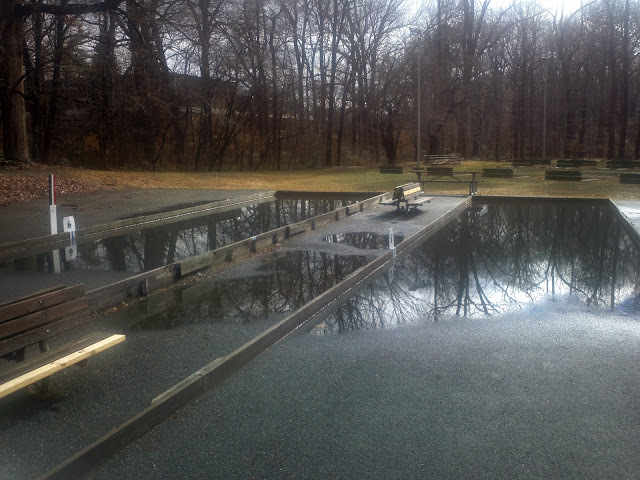 Once installed, your court will take some time, maybe as much as a year, to “settle in” under the influence of the weather, rain and snow, your walking on it, and so on. Then, over years of play, the surface will change as rocks get crushed into dust, and material migrates from high-traffic to low-traffic areas, and from high spots to low spots. High spots will get hard as they get packed down and the dust layer washes off. Low spots will get softer as they fill with finer particles. That is, your surface will vary from spot to spot, and over time. In short, it will be Just Right for a petanque court. Kim & Jules, thank you both for your thoughtful entries! I have sandy soil, mostly sand. Is there anything I can add to it so surface will be firmer? Yes, there are a number of things you can do. Here’s what I would recommend. Google around for general information. Search for something like How to firm up sandy ground?. That will give you a good overview of possible options. Pay a visit to your local dirt/sand/gravel company and tell them what you want to do. If you can, find a company that, in addition to delivering materials, also has experience in doing construction projects in your area— things like installing dirt/gravel paths in public parks and around buildings. Hi, I have played on Alexandra Park petanque piste in Bath many times, it is great that it is open to the public. Now that I live in Hampshire / West Sussex, I wish to find out if there are any more public petanque pistes or at least a list of known public pistes in England, does anybody have any ideas? I have found one on Hayling Island, but wish to know of more places I can get my friends and family involved without joining a club. I have searched thoroughly online without much luck… It would be great if anyone has a contact for Brian Forbes since he has done much construction work on these pistes. Hi Thomas,there is a public piste on Godstone green,Surrey. I am also in the process of trying to get the council to install one in the Memorial park,Redhill,Surrey. They are out there,just a bit tricky to find. What is the best way to maintain the ball divots on an ongoing basis? If your gravel surface is thick, thrown boules can leave big holes. For that kind of problem, before you start playing for the day you can rake and smooth out the surface with an ordinary leaf rake. For a very big terrain, using a rope or chain to drag something like a piece of old carpet across the terrain will smooth it out nicely. Thank you for the advice! I will give it a try. My rake seemed a bit hard so will try the carpet option. Any idea on how the indoor petanque piste were built especially like those we see in the French tournaments held in multi-purpose halls ? Indoor boulodromes that are permanent are basically covered outdoor boulodromes. The question that interests both you and me is: How are temporary playing areas built? And perhaps even more interesting: How are temporary playing areas removed after the competition? A few years ago I saw on the web a series of photos of a temporary indoor playing area being built inside a French sports hall. (I can’t remember what the event was… I’ve tried to find the photos again, but failed.) As I remember, the photos showed some kind of large black protective sheeting being laid down. Then the sheeting was covered with dirt (decomposed granite?) and surrounded by sideboards. Although the photos didn’t show it, I’m pretty sure that somewhere under the dirt, either above or below the sheeting, sheets of plywood must have been laid down to protect the floor of the hall. In some Youtube videos you can see that the terrain is very hard, and half-lobbed boules make a short of hollow knocking sound when they hit the ground. It sounds like there is plywood not very far beneath the surface. Sometimes a boule will land and then bounce wildly high in a most unnatural manner. My theory is that those boules hit the corner of one of the sheets of plywood, and the plywood acts like a springboard, snapping the boules back up into the air. Unfortunately, that series of photos did not show the playing area being removed. I’d love to know how it was done. I think that, in order not to damage the sheeting, earth-moving machines could not be used. Most of the the dirt probably had to be swept up by workmen with brooms and then carefully removed with shovels. But that is only a guess. Thank you. Yes, it is those temporary petanque playing areas that pique my curiosity. As far as I know, it will mostly be hard solid concrete floor for most multi-purpose halls. It will be interesting to know how many layers and thickness of such a playing area.